Small, wrinkled amber colored tubers that grow just beneath the soil’s surface, tiger nuts number among the first foods cultivate by early humans, and they remain a traditional food and source of nourishment in West Africa and Spain, today. I first stumbled across the tigernut when Our True Roots offered to send me a packet. I soaked and nibbled a few, and loved their soft sweetness and their nut-like flavor which reminded me of freshly roasted chestnuts. And as ideas circled in my head about just what I’d do with them (a puree, perhaps? an addition to no-knead sourdough bread? chopped and added to ice cream? ), I happened to meet a gentlemen who described his love of tigernuts in such detail, I couldn’t help but fall in love with them myself. I was traveling, and my bags were delayed, and my driver and I began to talk. He explained that he had immigrated from Nigeria, was ready to take his citizenship test so that he could bring over his wife and four boys. And though he was young, he and his story reminded me of my grandfather who emigrated from Germany to the US. As we talked, I asked him about the foods of his youth, and those made for him by his mother and grandmother. It’s my favorite conversation, and my favorite source of inspiration in my own cooking and writing. He described hearty, spiced stews of pumpkin, greens and mutton, and skewered meat slathered in chile peppers and grilled. And, finally, he described Kunnu Aya, a drink I later learned to be tigernut milk also referred to as horchata de chufa in Spain. And while tigernuts still captivate the hearts of people as a traditional food of Africa and Spain (where it was brought by the Moors), archaeological evidence indicates that the tigernut was a common food source during the paleolithic, or pre-agrarian era in Africa. Tigernuts are often used in various ways in traditional Nigerian cuisine, but the beverage kunnu aya, or tigernut milk is particularly well-loved. It is also blessedly easy to make, requiring nothing more than tigernuts and water, though the addition of spices and a natural sweetener like jaggery or honey elevates the humble tigernut milk into something positively ethereal. 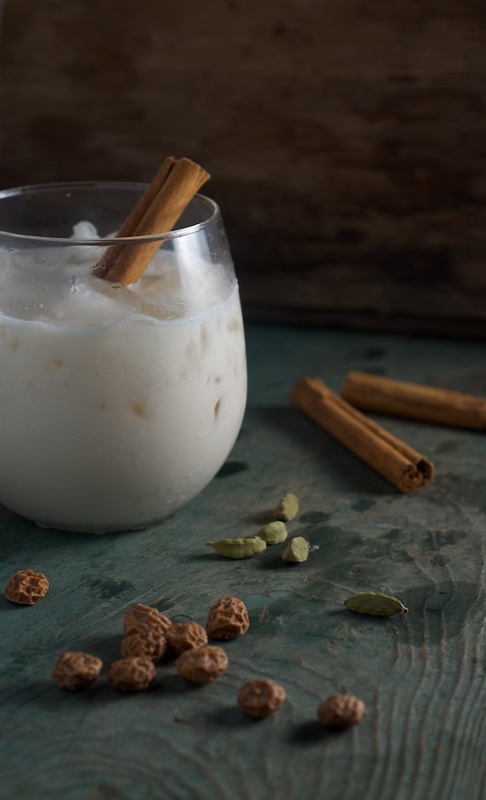 Tigernut milk (called Kunnu Aya in Nigeria and Horchata de Chufa in Spain) is naturally sweet, creamy and offers a luxurious, rich and nutty flavor. Unlike milks made from almonds or other nuts which are typically very high in inflammatory omega-6 fatty acids, tigernut milk is, instead, rich in monounsaturated fat, as well as minerals and vitamins C and E. For this reason, as far as non-dairy milks go, I tend to prefer tigernut milk or coconut milk. Tigernuts are a rich source of nourishment, and remain a significant source of food for both the poor and the wealthy throughout northwest Africa. They’re rich in minerals like calcium, iron, magnesium, potassium and phosphorus, as well as vitamins C and E. They’re a good source of oleic acid (a monounsaturated fat also found in olive oil, avocado and pork fat), and which is associated with increased HDL (good) cholesterol levels. 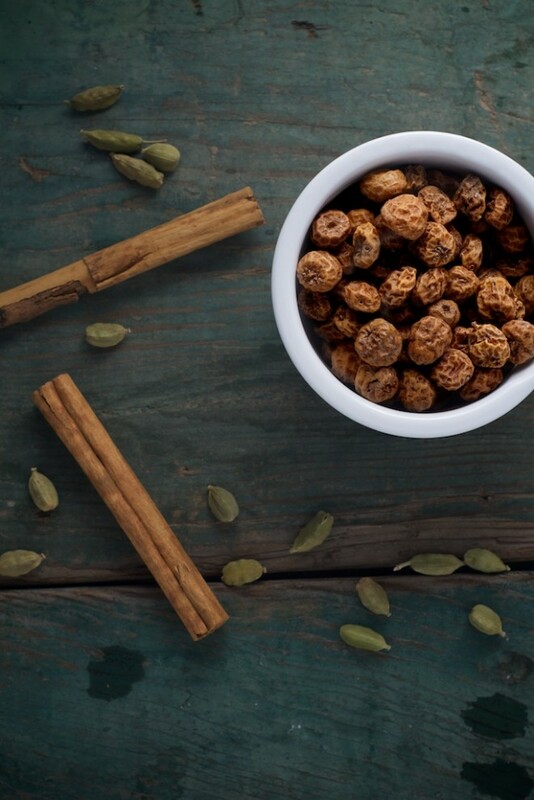 Tigernuts, also a member of the nutsedge family, are also traditionally used in folk medicine along with ginger and mints to treat upset stomachs, digestive issues and irritable bowels (read about it here). Tigernuts are also a good source of prebiotics (that is food for the good beneficial bacteria in your gut!) like inulin and resistant starch. And, remember, tigernuts are not nuts. They are tiny tubers with a nut-like flavor and nut-like texture, so for those people who must avoid nuts, tigernut makes an excellent alternative in baking and cooking. You can find tigernuts on the shelf in health food stores like Whole Foods Market, as well as online through Amazon. 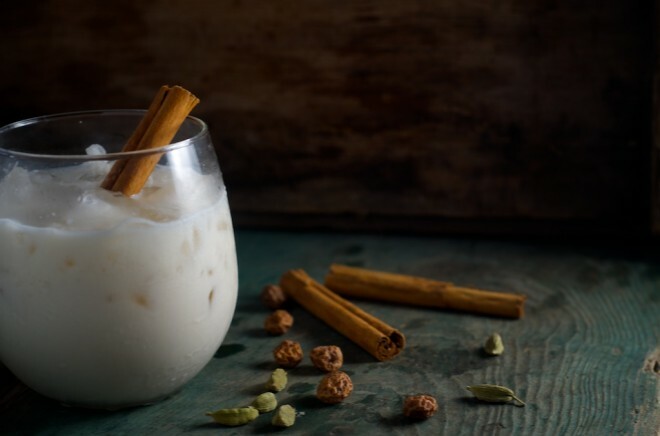 Our True Roots not only offers whole, organically grown and non-GMO verified tigernuts through retailers like Whole Foods Market and Amazon, but they also offer fresh tigernut horchata in select markets, so be on the look out for it. You can also follow them on facebook here, or twitter here. A traditional food of both Spain and Nigeria, tigernuts are rich in minerals including calcium, iron, magnesium, potassium and phosphorus. They're also rich in vitamins E and C. Tigernut milk (or Kunnu Aya) is a traditional Nigerian method of preparing tigernuts, which highlights their natural soft, sweet creamy notes and a flavor reminiscent of roasted chestnuts. Pour the tigernuts and cinnamon stick into a medium-sized mixing bowl, and cover them with warm water. Allow them to soak in the water at least 12 and up to 24 hours, or until softened. Transfer the tigernuts, soaking water, cinnamon stick, cardamom pods and jaggery to a high-powered blender, and until they form a smooth paste, adding water as necessary to allow even blending. Allow the paste to sit in the fridge for an hour to rest, and then spoon it into a nut milk bag, press it through, and serve over ice. This post is sponsored by Organic Gemini. Thank you for supporting the companies that I believe in, as it helps me to continue bringing you beautiful recipes and high quality content. I live in Spain and I don’t like the horchata I’ve tried here. I’m guessing it’s a far cry from the traditional recipe 🙁 This makes me want to try making it, though! I’ve never seen tiger nuts in the store here but surely they are available somewhere! Jessica, I live in Spain too and just ran across Tigernuts by accident last week. I found them in an “especias” / spices store. Tiger nuts is a very good nourishing milk. Its available in Nigeria in large quantity and quality. I deal in exporting all produce product like Cashew nuts, Cocoa and Tiger nut as well. You can contact me if you wish I supply you Tiger nuts or any other products. Where are your Tigernuts from and how much do you charge for them? You mention a nut milk bag in your directions. What is that and where would I get it? Any ideas about what to do with the tigernut pulp? I’d really like to use it for something! Good luck & have fun experimenting! I’ve been using ground tiger nuts in baking to replace hazelnuts and almonds for my nut-allergic son. They are awesome, and tastewise are really close to real nuts. Monika, how do you store your tiger nuts? Yum. I love Chufa horchata. My recipe is similar to this with the exception of the cardamom. Will try your recipe next. This sounds delicious! Do you happen to know if tiger nuts are allowed on the GAPS diet? I’ve never heard of them before and don’t know about their starch content. I sourced them from JK’s kitchen in Vic Australia. They will ship them out to you. Their number is 9355 8416. Still having trouble using up the pulp. Any other suggestions? If using tiger nuts for baking or other recipes, should they be soaked and dehydrated first? I second that! Tigernuts are highly nutritious and ensures the goodness of several prominent nutrients. They are extremely good for the cholesterol management. This recipe is perfect and I am glad that I came across it 🙂 Thanks motivation! While this looks and sounds incredibly delicious, do you have any information on the impact on the land or people, not to mention global shipping impact, of introducing many north Americans to these tubers? Since I switched from a raw, vegan diet to traditional foods, I find myself spending more on local heirloom everything (nuts, legumes, flour) and less on exotic and often, environmentally devastating foods, such as the whole palm oil/deforestation/orangutans controversy. Hopefully these legumes are merely a carbon-stomp away, and that is all..? This is important to know Maggie. I was very lucky to get some as a gift from my daughter when she returned from Africa and I have enough for the next while but I would be concerned should I buy them here. Apparently it’s easy to grow and rather invasive. A different environmental concern since hunters have been spreading it to grow in fields as animal feed. Wild turkeys especially love it. Here’s an article about growing & harvesting in Canada. Do you remember what they are called (or brand name) in Whole Foods Market? Just went and they didn’t seem to have them. Called another, and they couldn’t find them either. Thanks! Evan – I believe they’re called tigernuts and are sold by Our True Roots. Oh! For clarification ounces is NOT a volume measurement. It is a weight measurement. Fluid ounces is a volume measurement (but also a weight measurement) since 1 fl ounce is the volume that 1 ounce of water weighs. A good rule of thumb would be to measure solids (like tigernuts) as ounces, and liquids (like milk) as fluid ounces. Thanks so much for this! I have tigernuts soaking right now! Do you know how long the milk stays good in the fridge? Good question Brittany! We made some and it was delicious but needs to be consumed rather quickly. It went off after a couple of days and also separated. There was a thick, starchy layer at the bottom of the bottle just like cornstarch. I will be making this again but only in small batches. I just received a gift of both dark and light tiger nuts from my daughter who has just returned from working in Rwanda and Ghana! I have two large sacks of these little treasures and will be soaking some soon to make tiger nut milk. I wonder, does anyone know how to safely clean them and also how to store so this precious gift does not go to waste? Can they be frozen or will they keep well in a cool pantry like you would potatoes? Love this idea, ordered some tigernuts right away and have them soaking in this recipe now, with the addition of some ginger. Looking forward to a happy full-moon treat this weekend, even if it’s higher on the carb scale than I usually go. 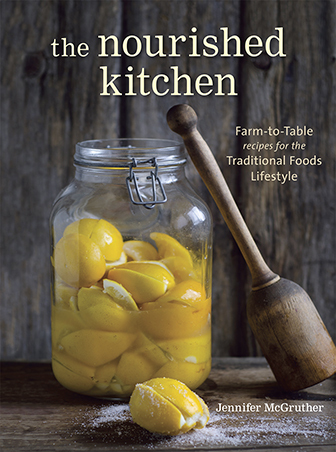 Also looking forward to receiving my cookbook and culling all the happy paleo-friendly and fermented recipes. 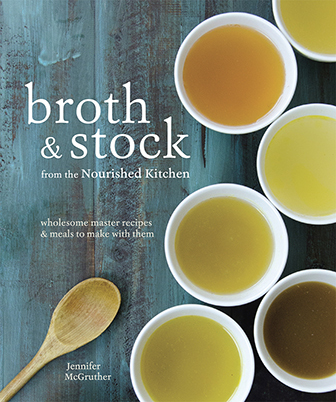 My neighbor eats the kinds of things I don’t, and we’ve agreed this is a cookbook we can both get behind each in our own ways. I like the idea of adding ginger which I will do for my next batch. I don’t see any fair trade certification on the OurTrueRoots bag at the Amazon link. I would like to try these but I’d rather ensure they’re fairly traded. Just reporting back — I absolutely LOVE this beverage. And now I’m playing around/experimenting with the possibilities using the squeeze-dried tigernut “flour,” mixing it up a bit with eggs tonight for a little fry-cake improvisation. Hate throwing anything away. Maybe a followup recipe is in order, do we know of anything traditional using a minimum of ingredients using the tigernut chaff? Thanks for bringing this one to us! Yes! Actually, I’m working on a few too. I positively hate waste, plus tigernut tastes really delicious. I am unable to find out where these are grown, if they are imported from Africia and packaged here…..I’m a little reluctant in buying anything from there, organic or not, at present with the Ebola outbreak. Infected workers could contaminate. Do you know where they are grown? For what it’s worth, the Ebola virus is not transmitted via food or water. Another idea: I just used the milk as a cold-liquid base for some homemade jello. Cool, creamy, delish! I do my jellos from scratch and eyeball it mostly, but basically just use the liquid/gelatin ratio of your choice, I added a few drops of almond and vanilla to sweeten it up a smidge. I have been soaking my tigernuts for more than 48 hours and they are still hard as rocks! I bought them from your link. Could it be the metal bowl plus air conditioning? It’s about 106˚ F heat index outside but the a/c is on 77. Hmmm…. please advice. i am itching to try this. restart with warmer water in a different bowl and a fresh cinnamon stick!? Same here! My tiger nuts are going into day 3 and still hard as rocks! Nowhere in this post do I indicate that the tiger nuts will or should soften. It says something about “until softened” under #1 instructions, but I think you must have meant the cinnamon stick? But, I figured it would work, since you did it, so I put it in my vitamix and it was fine! tastes very yummy! I can’t have much sweetener so I used a little stevia and 1 Tablespoon honey. Love it! And i love your new book too. Thank you! Is it is truly necessary to soak them? I, too, have soaked mine for a few days and they didn’t swell or anything. This makes me wonder if it actually is necessary to soak them. Have the tigernuts been soaked prior to processing the flour? I’d love any replies! Thank you so very much! Yes, you need to soak them. Still wondering the best way to keep these tiger nuts I have from going moldy. A few of them are already starting to go. I’ve been given too many to milk and consume quickly enough. Today I will pick them over very carefully and wash them well and perhaps throw them into freezer bags and freeze. This is exciting! I too love tiger nut milk, and I use it my dahl recipes and it turns out great. I’m also doing research in tiger nut oils. This is to inform you that you can put tigernut safe in freezer and keep in room temperature shortly before you use it. It is a pleasure that you all enjoy the tuber. I’ve made a couple recipes with tiger nuts. They recommend to soak, but even after 24 hours, mine were still quite hard. I soaked them in water in the fridge. Should I have kept them at room temperature? Oops, disregard my comments. I should have read ALL of the other posts first! Sound like tiger nuts never really soften. I’ll make do with them hard like they are, because I love the flavor! Im from Spain, I love horchata but here hey use to put a lot of sugar in the beverage. Now I’m pregnant and I don’t have any kind of sugar, so I tried your recipe. The problem is than yesterday I blended it and put it in the fridge (not two hours as you said) the whole night, and I tried in the morning and was a little bit acid and sticky. Has this happened to you any time? Are they so delicate? May I throw it away? It sounds delicious, and it’s so not the usual recipe you’ll find on like 3 gazillion sites! Am in nigeria where am pretty sure of getting fresh tiger nut,do I still need to soak it before blending? And can I filter the juice with white handkerchief? Yes, you still need to soak them. I’m in Nigeria, and in the part of country I’m in (northern) it’s mostly consumed. Here you need not to soak. Just wash properly add few ginger, if you like add soaked date then take to the grinder. Afterwards sieve and refrigerate. Please make sure you refrigerate same day cause it can ferment. Hope this helps. Sometimes when I make this recipe, it turns out great and I can keep it in the fridge for about a week and it tastes great still. But sometimes when I make it it gels up and sours….I always refrigerate imediatley. I cannot figure out what I am doing differently to make it source sometimes. Perhaps on the occasions it has soured, I have just soaked it too long. I will try your method, thank you. Has anyone else had this issue with gooey horchata? thanks alot but there are some things to be add as nigerian recipes eg sweet potatoe,dates,watermelon and milk. Do you know if tigernut milk could be used to make yogurt or kefir? HAve you ever preserve the tiger nut milk for more than three days? I have really good childhood memories of kunnu aya and as a child we use to chew on the nut to get the milky juice and spit out the fibre. Do you discard the butternut puree after? I can compost, but was hoping you’ve used it as a flour for baking, perhaps?! Thank you, Auto-correct…but I meant tigernut, not butternut. Yes, I discard it. You could keep it or compost it or try to dry it into a flour and let us know how it goes. I love tigernut milk, but, wonder why it gets slimy and mucilaginous after 1 or 2 days? At one point, I thought the soaking water was too warm, but, I get the same result from cold water processing. I use a vitamix for blending. The first day is perfect, although there is a significant amount of starch that settles. Two days after, the milk separates and even after shaking, there is a thick slimy character. I haven’t had this experience. It’s possibly the fiber solidifying. It’s rich in the same type of starch as arrowroot, which also takes on a viscous, slimy texture. As long as it smells and tastes okay, I think it’s alright. Are tigernuts GAPS friendly??? I am on Stage 2 intro. I desperately need these!